Germany is not just known for it's outstanding vehicles, we just love to care for the details and always try to surpass the expectation of our customers. 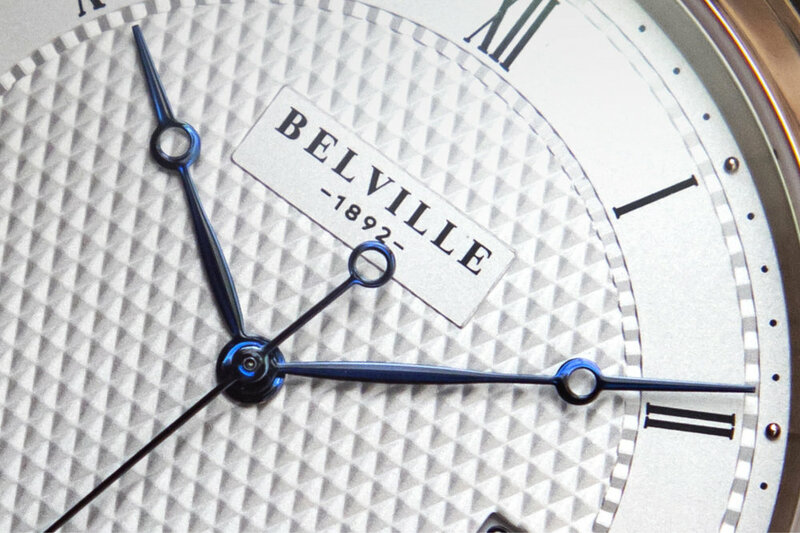 Your Belville timepiece is designed, constructed and made right here in Germany by our highly skilled team. We check every component, every detail and each watch with the highest degree of accuracy to ensure your satisfaction with our timepieces. 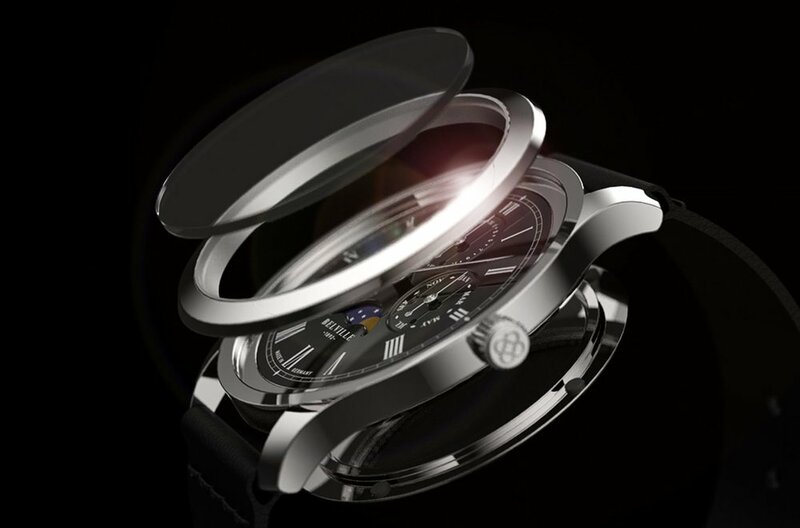 Unlike most watches that come below 1.000 USD, we’ve designed a complex 3 piece case out of surgical grade 316L stainless steel (5ATM), which you’ll usually only find at top luxury watches. To ensure that you may enjoy your watch for decades, we equipped every timepiece with an extra scratch resistant sapphire crystal with anti-reflective coating. The dial is an art for itself, done by skilled craftsmen with the traditional tampon print process. Most of our dials have been sunray-brushed, an abrasive finish characterized by purely radial lines. 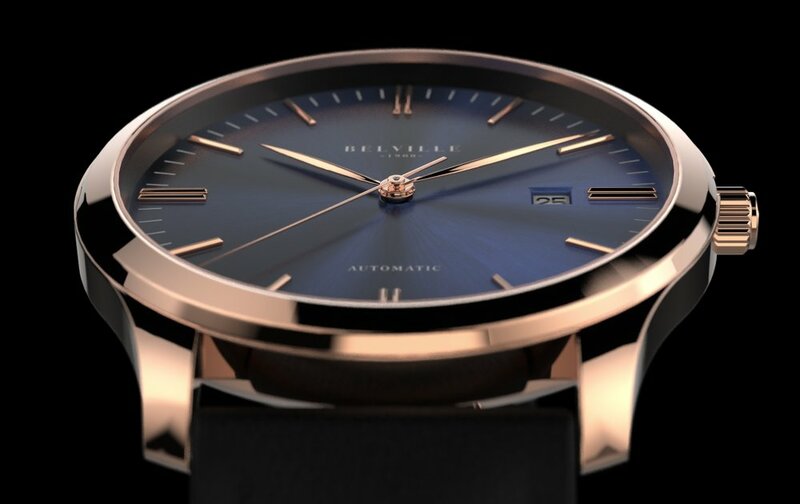 Our Topline “Greenwich Collection”, comes with a laborious guilloche design, which underlines the classy and timeless look of your Belville timepiece. We chose the famous Citizen/Miyota 9100 movement for our “Royal Hill” Collection, which was an easy choice to to the outstanding reputation that it has achieved worldwide. The automatic winding three hand movement comes with a date complication which we place at the 3h position. Equipped with 24 Jewels and a power reserve of 42 hours at 28,800 beats per hour, ensure a precise timing for lifetime. Our “Greenwich” line, the top line of our collection, comes with an high-end Swiss made movement, made by the renowned movement manufacturer Sellita, who also works for the top luxury brands from Switzerland. 26 Jewels, a power reserve of 38h and and the swiss accuracy will ensure your long lasting joy with this exclusive watch. Obviously we decorated the movement with a unique rotor, which you’ll see through the open caseback. As we say here in Hamburg, you’re wearing the mink inside. 180 years ago clocks were not as accurate as they are today, so John Henry Belville, a London businessman had the bright idea to sell people the right time. He would start his day by going to Greenwich Observatory to set his pocket chronometer to Greenwich Mean Time before visiting his customers in the City and in the West End and setting their watches correctly. By 1836 he already had 200 clients. He died in 1856, whereupon his widow Maria continued the business until passing the reins to her daughter Ruth Belville (1854 – 1943) who ran the business afterwards.